The chemistry is altered in the cave water below a bushfire. Raging fires on the surface of the planet affect caves that intertwine below. Research into climate history is now complicated by this finding. 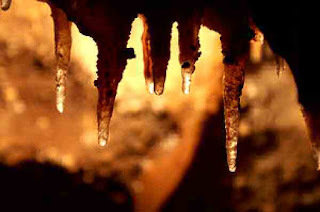 Australian and UK scientists analysed water dripping in cave after a fire and found that the chemistry of moisture changed. There could be a new horizon, however. Stalagmites and stalactites store information about fires. The caves tested have clear data stretching back 200,000 years. Oxygen-16 is lighter than oxygen-18 and it evapourates quicker, so dripwater with more oxygen-18 would indicate fires or hot spells above. Pauline Treble of the University of New South Wales found that sites in a cave only 23 meters apart had different water chemical readings. This was caused by a recent bushfire in 2005 localized to one of the cave sections.